Go to google.com and type in the word “evolution.” Then click on the “Images” tab and you will see the same image, or a variant of it, displayed over and over again. We have all seen the picture before. 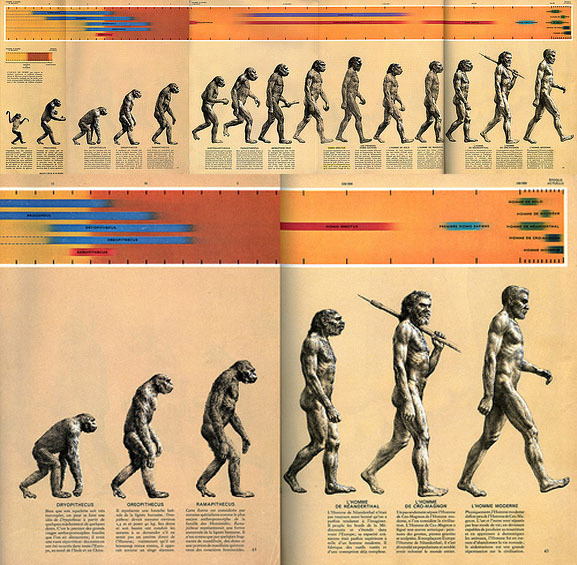 It was originally coined “The March of Progress” and is supposed to display human evolution throughout history. While this image is potentially the most famous and iconic scientific diagram ever constructed, it is extremely misleading. It has been the cause of a number of misinformed criticisms to the theory* of evolution. The king of all misinformed critiques asks why chimpanzees are seen on the left side of this diagram, modern humans are seen on the right, but none of the intermediate species still exist today. This is because the organism on the left of this diagram is NOT supposed to be a chimpanzee. This tree shows which groups formed first, from left to right (Primates, Haplorhini/Strepsirrhini, Simiiformes/Tarsiiformes, etc.) 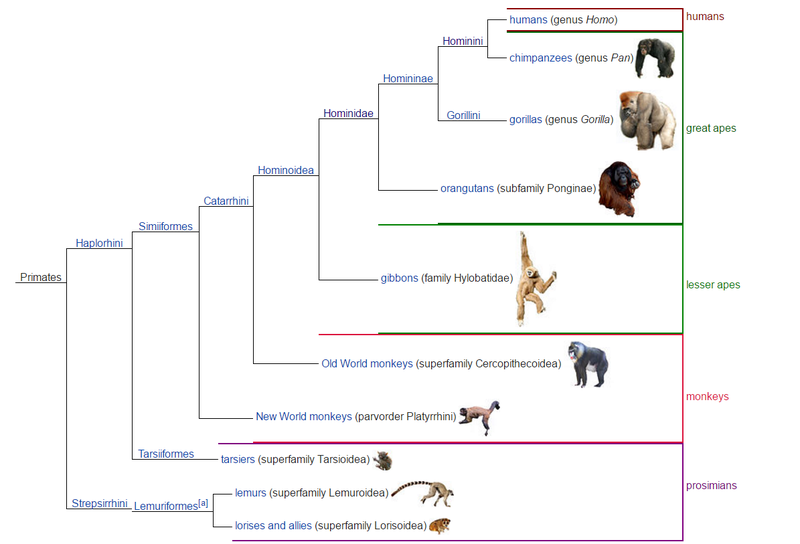 and some of the subdivisions that occurred within the primate lineage in order to form the Homo clade. This is where humans reside. We are known as Homo sapiens. We are also not the only group that has ever existed that falls within the genus Homo. However, we are the only group of Homo that is still alive today. That is why our closest living relative is the chimpanzee, a species that falls under the genus Pan (Pan troglodytes). As you can see, we do not directly come from chimpanzees. Instead, we simply share common ancestry with them. Next week, I will discuss more about some of the other groups of Homo that walked alongside our ancestors, known as the Neanderthals and the Denisovans. *It is important to note that a scientific theory is not the same as a theory in other fields. It is not simply a hunch. In order for a scientific explanation to become a theory, it has to have passed every test that it has ever been put through. Every bit of evidence that has ever been gathered by mankind supports the theory of evolution. In the scientific community, its existence is not something that is still debated. In laboratories around the planet, including the one that I am part of, we study specific aspects of evolution. However, we do not refer to the theory of evolution as a “fact” because we can still incorporate new data into the theory. It is malleable, but will not be disproven.